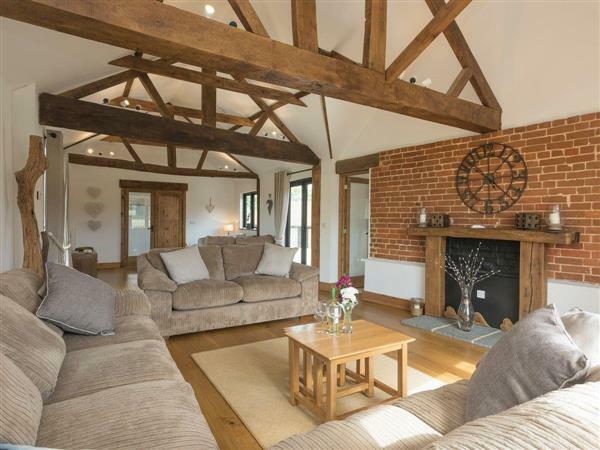 Summer House Stables in Catfield, near Stalham, Norfolk sleeps 6 people. Summer House Stables near Stalham is a barn conversion which is tucked away down a country lane, in the heart of Broadland, and with glorious views across open fields. Summer House Stables offers spacious and a thoughtfully furnished interior, as well as a large enclosed garden, complete with a hot tub. The village of Catfield is located just 1 mile away, and offers a local shop and pub. Set amongst a gentle and tranquil rural landscape, dotted with ancient churches, wind pumps and nature reserves, this area of Norfolk offers a wealth of opportunity to enjoy walking, cycling and bird watching. Nearby, How Hill Nature Reserve with its marshes, meadows, woodland and open water, is well worth exploring. Riverside pubs and cafés are plentiful and a number of Broadland centres offer bike and canoe hire - possibly the most delightful way to discover the lovely reed lined waterways and their abundant wildlife. Visitors can also hire boats at nearby Potter Heigham just 3 miles away, or take a cruise from bustling Wroxham, the capital of the Broads. Close by, BeWILDerwood, a magical tree top park, promises children a day to remember, and lovely dune backed sandy beaches are a short drive in Sea Palling. For lively family fun, visitors need look no further than Great Yarmouth with Pleasurewood Hills theme park, whilst Cromer also offers traditional seaside entertainment including a renowned end of pier show. Bygone museums, craft centres and National Trust Blickling Hall are all within an easy drive, as is the medieval city of Norwich, with its magnificent cathedral, castle, galleries, museums, cinemas, theatres and excellent shopping. A little further afield on the north Norfolk coast, seal watching boat trips can be found at picturesque fishing villages, many of which also boast pubs and restaurants serving superb, locally caught seafood. Coarse fishing is available on a private lake, and the pretty village of Ludham, just 2 miles away, boasts two pubs and a good range of shops. The beach is 7 miles from Summer House Stables near Stalham. With the shop, pub and restaurant being 1¾ miles from Summer House Stables. Summer House Stables near Stalham is all on the ground floor. Living room: With Freeveiw TV, DVD player, beams and wooden floor. Kitchen/dining room: With electric range, microwave, fridge/freezer, dishwasher, washing machine and tiled floor. Bedroom 1: With super king-size bed, Freeview TV and en-suite with shower cubicle and toilet. Oil central heating, electricity, bed linen, towels and Wi-Fi included. Welcome pack. Large, enclosed lawned garden with sitting-out area and garden furniture. Hot tub for 6 (private). Private parking for 4 cars. No smoking. Holidays at Summer House Stables run from Saturday to Saturday. Pets allowed at Summer House Stables. For a better idea of where Summer House Stables is, you can see Summer House Stables on the map below. Summer House Stables is in Norfolk; should you be on the lookout for a special offer, you can find all the special offers in Norfolk. It's always worth checking to see what is on offer at the moment. Do you want to holiday near Summer House Stables (UKC2145), you can see other cottages within 25 miles of Summer House Stables; have a look to find your perfect holiday location.